Playing out of a fairway bunker is considerably different from hitting a greenside bunker shot, mainly because you must hit the ball before the sand to escape the fairway version. A lengthy bunker shot requires a longer swing, too, which makes it difficult to keep your balance given the sand's tendency to shift. Therefore, it's important to keep the lower body as “quiet,” or still, as possible on a fairway bunker shot. An active lower body, with a lot of movement in the feet, knees and hips, may cause you to slip or slide out of position, all but guaranteeing poor contact. Take at least one club more than you'd hit from the same yardage in the fairway (i.e. a 7-iron instead of an 8), and grip down a little. Assume a slightly wider stance than usual, with plenty of knee flex. Dig the feet into the sand a half-inch or so. Don't go too deep, though, or you'll change the plane of your swing. Swing smoothly at 80 percent power, keeping the lower body still (but not stiff). Hold your position on the follow-through; this thought will help you make a steady, balanced swing. Fairway bunkers are frequently overlooked. While most players will pay attention to a deep greenside bunker when planning an approach shot, fairway bunkers don't tend to get the same kind of respect. Sure, you know that you want to keep your ball on the grass whenever possible, but you may not plan around a fairway bunker in the same way that you would avoid a water hazard. This is a strategic mistake, as fairway bunkers – in some cases – can be just as punishing as a water hazard, if not worse. Despite their often-benign appearance, every golfer should give fairway bunkers the respect they deserve when planning a tee shot. Of course, even if you do give fairway bunkers plenty of respect, you are still going to end up in them from time to time. No golfer is perfect, and you aren't always going to be able to hit your selected target – even if you are being smart and playing away from the sand. So, with that in mind, you do need to know how to play from fairway bunkers when the situation arises. With the right technique in place, you can have confidence that you'll be able to escape cleanly from a fairway trap. To get started, you need to understand that you don't want to dramatically change your swing technique just because you have stepped down into the sand. There are some changes that are going to be required, to be sure, and we'll cover those in this article. With that said, making wholesale changes to your swing mechanics is just asking for trouble. Stick with the same basic swing that you use on the rest of the course while tweaking just enough of your technique to achieve optimal results. It should also be mentioned that your expectations need to be lowered as soon as you go into a fairway bunker. Hitting an approach shot from 150-yards is far more difficult from the sand than it is from the fairway, so you shouldn't have the same expectations in terms of results. That doesn't mean you should be thinking negatively about the shot at hand, but you do need to be realistic. If the hole is cut in a tight section of the green near another bunker and some deep rough, you'll want to think twice before firing away. Pick safe targets while playing from a fairway bunker and focus mostly on just getting the ball back in play. So, why is it harder to play from a fairway bunker than it is to hit a similar shot from the grass? There are a number of challenges you are going to face when you head down into a bunker for a long shot. By understanding the challenges, you can start to get a clear picture of what you need to do to have success in this setting. Let's take a look at a few of the common issues you'll see in a fairway bunker. Getting over the lip. The first thing you will have to think about when you play from a fairway bunker is clearing the edge of the trap. Some fairway bunkers are shallow, meaning this is not really going to be an issue, but many others are rather deep and tough to escape. Obviously, your first goal on any bunker shot – fairway or otherwise – should be to simply get out and back onto the grass. When hitting from a fairway bunker, you should error on the side of caution and be sure to use enough loft to get out. Even if that means you can't reach the green with this shot, that's okay – job number one is just to get out and minimize the damage. Making clean contact. You will be punished more harshly for poor contact in a fairway bunker than you will be when playing from the grass. If you hit behind the ball while in the sand, the density of the sand is going to quickly rob you of most of your swing speed. This type of mistake will result in the ball coming up way short of the target – you may not even get halfway there, in fact. On the other end of the spectrum, a thin shot might not get out of the trap at all. Since a thin shot is going to come out low, the edge of the bunker is likely to stop this shot in its tracks. There is a premium on making clean contact from fairway bunkers, so you'll know you have no margin for error while you make your swing. Maintaining your footing. Golf shoes are designed to help your feet grip the grass as you swing, and they generally do a great job. They can help you in the sand as well, but they are not as effective in this setting. If you make an aggressive swing in the sand, especially when the sand if fluffy, there is a fair chance that you will slip a bit during the swing. Even a small slip can make it extremely difficult to achieve solid contact at the bottom of the swing. If you are going to hit nice fairway bunker shots on a regular basis, learning how to maintain your footing should be a top priority. Dealing with a variety of lies. When you hit the fairway, you can generally expect to have a good lie for your next shot. You might get unlucky from time to time and have your ball stop in a bunker, but that is the exception to the rule. Most of the time, your lie will not be an issue. That is not true when you venture into a bunker. You can wind up with all kinds of different lies in the sand, and many of them are ugly. The ball could plug down deep into some soft sand, or it could sit on a hard-packed patch where there is hardly any sand at all. In addition to the actual lie of the ball, the stance you have to deal with is another complicating factor. There is frequently some slope to deal with in the bottom of a trap, meaning you have yet another variable to consider. All in all, a great lie in a bunker is a rarity, as there is usually some type of difficulty to overcome. It is not by coincidence that fairway bunker shots are considered some of the most difficult in the entire game. These are hard shots, and playing them successfully requires a combination of great technique and plenty of practice. Of course, both of those points pose a problem for the average amateur golfer. The typical amateur doesn't understand the swing technique they should use in a fairway bunker. And, even if they do understand the right technique, it is likely that they don't practice enough to master it. In the next section, we are going to explain how you can tweak your swing technique to suit the demands of fairway bunker shots. As was referenced in the title of this article, the stability of your swing is going to play an essential role in the fairway bunkers. To strike the ball cleanly from the sand, you need to make a stable swing from start to finish. That means you shouldn't have any extra moving parts, and you shouldn't feel like you are leaning in one direction or another. You should be grounded, balanced, and under control at all times. While it is true that those characteristics are positive attributes for a swing made anywhere on the course, they are particularly important in fairway bunkers. If you would like to learn more about how to add stability to your swing, please review the tips below. Widen your stance slightly. Anytime you want to add stability to your swing, using a wider stance is a smart way to get started. A wider stance is going to limit the lateral movement in your swing, allowing you to stay centered nicely over the ball all the way through impact. When you use this tip in a bunker, however, you will also need to make a second adjustment. Since a wider stance is going to effectively bring you down a little closer to the sand, you'll also want to choke down on the grip of your club by an inch or two. That will shorten the effective length of the club, giving you a better chance at clean contact. If you were to stay all the way up at the top end of the grip, you would probably catch the sand before you managed to hit the ball. Shorten up your backswing. 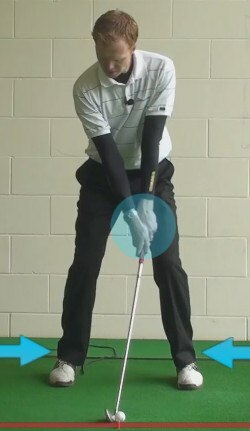 Another good way to stay balance is to shorten the length of your backswing a bit. This should not be a dramatic adjustment – you shouldn't suddenly cut your swing in half, or anything like that – but just try to stop a little short of what would normally be a full swing. By making this change, you will make it less likely that you'll wind up drifting to the right at the top. Some players, especially those with long backswings, get stuck on their right foot at the top and never make it all the way back over the ball prior to impact. By tightening up your backswing, your balance should improve and you should find it easier to hit clean shots. Stand slightly farther from the ball. This is a great tip for fairway bunker shots, and it is extremely simple to put into action. When you are getting ready to hit a fairway bunker shot, take your stance and then back up just an inch or two from the ball. From this position, you will feel like you are reaching out slightly at address – and that is perfect. This adjustment is going to flatten out your swing plane just a bit, allowing you to pick the ball off the top of the sand. You don't want a steep swing in this situation, and hitting down on the ball in the sand is a sure way to come up short. Move back a bit, flatten out your swing, and clip the ball beautifully off the sand. We mentioned earlier that you don't want to change your swing dramatically when you step into a fairway bunker, and you can see from the list above that we aren't recommending any major adjustments. You are going to use a slightly wider stance (along with choking down on the grip), you'll want to shorten your backswing, and you should consider standing farther from the ball. Each of these adjustments is subtle, and your swing shouldn't look dramatically different when all is said and done.